Confessions of a neurotic immigrant housewife: Look, ma - it's a seamless top-down! It all started last year when all of a sudden I bought too much yarn. Yes, I know, there is no such thing as "too much yarn" for a knitter, but all non-knitters will tell you what I am talking about. It means so much that you have absolutely to space to keep it. It happened to me for the first time in my life. Usually, I can control my yarn buying impulses. No, not totally control them, just up to a point... but still. How and why did it happen? We built a new house in Florida, and while I was in Pennsylvania, I kept ordering yarn online with the delivery address in Florida. Only when we came here in October and I saw all the packages neatly stored in my closet, I got worried that I won't be able to use all this yarn in my lifetime. Most of the yarn I ordered was from ColourMart and it was mainly scraps, odds and ends of great yarn in different length and color but the same weight - heavy lace. It took me a while to wound them up in balls. People who have done it at least once know what kind of nightmare I am talking about. People who've never done it before - please, please, please, don't buy this yarn in scraps, it's not worth it, believe me! Now I've got many-many balls with only two clear measurements for every ball - the yarn weight and the ball weight. Making socks from this yarn seems to me a waste of time: the yarn is too thin and the socks won't last long. Multicolored hats is another option. This year it might be my solution to the Christmas gifts situation. Still, I needed to figure out a kind of project to use up most of the yarn. And what is the best project when you don't know how much yarn you've got or when you can run out of yarn at any moment? Right, it's a seamless top-down. Fortunately, these projects are extremely popular now on Ravelry and outside of it. After making Arboreal, Birkin, and Order of the Garter, I became less afraid of the top-down projects. 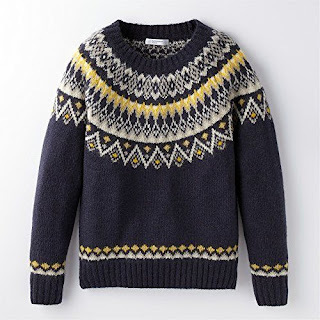 I was looking for a sweater like in my inspirational board on Pinterest - modern with a bold colorful design, with some folk references but without traditional flowers or snowflakes (I am more into geometrical stuff right now). 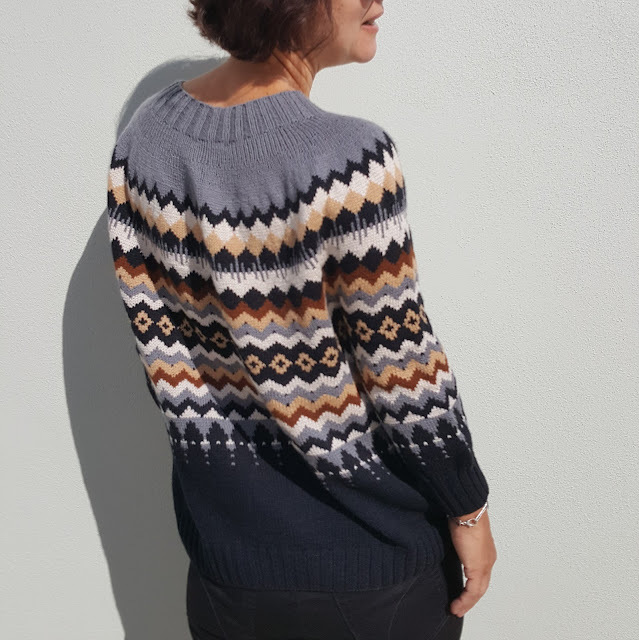 Finally, while making the Clear Creek Cardigan from the Interweave Knits Spring 2018 issue, I found my project of interest - Elk Meadow Pullover by Paula Pereira. 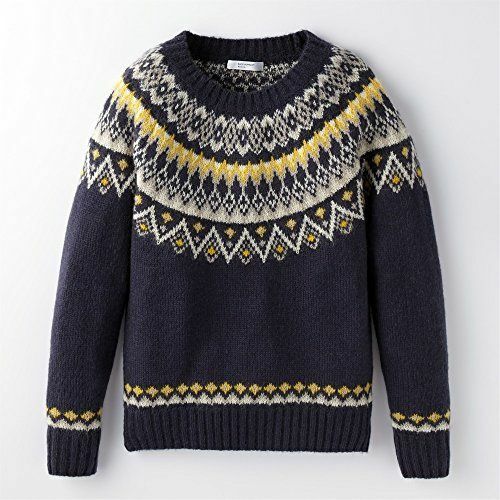 The pullover blends into background which is light blue, almost like its main colors. Plus light blue pants on the model don't improve the picture either. 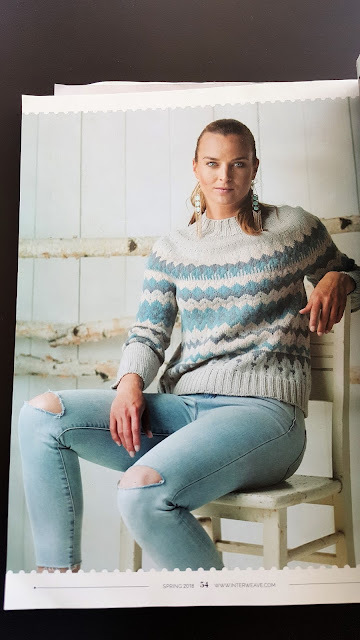 And the last unfortunate touch is the model's earrings - they are pretty, and folksy, and also have almost the same color, and are very distracting from the actual knitted garment they are supposed to help to showcase. 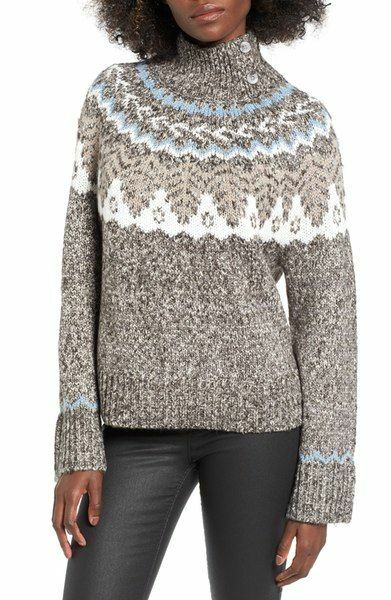 In my opinion, it would look much better with a darker background - teal or brown - and some dark pants or skirt. Oh, and without the earrings for sure, but I digress. Back to knitting! 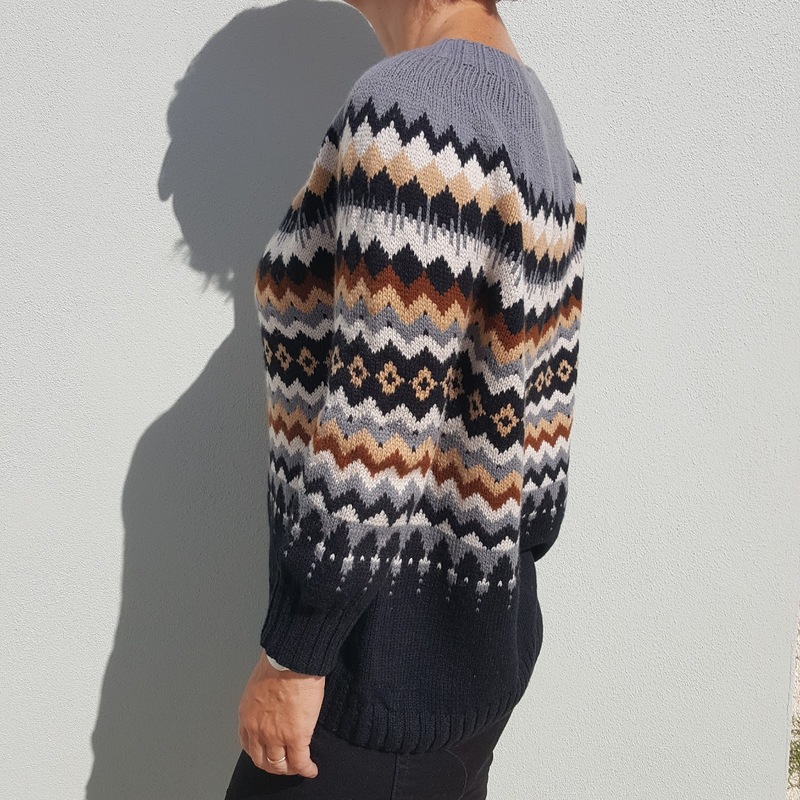 Anyway, since making the Clear Creek Cardigan took a while, I kept spotting the Elk Meadow pullover, spending longer and longer time observing its unusual geometrical design, until at some point I imagined it in other colors - my colors - and that was it. I knew what I was going to make from the ColourMart scraps! My gauge was totally off: 30 sts and 36 rows in 10 cm (unwashed). Eventually, after washing and steaming the finished sweater the gauge became 28x34 in 10 cm. The pattern gauge is 24x30 in 4". I had to do a lot of math. Here is what I did and how I did it in case you get the same gauge and want to replicate my process. Truth be told, it was really painful at times - it took a lot of unraveling and starting over. Yet, it was extremely rewarding and fun to make and I am totally in love with the end result. fourth inc row - *K4, inc one st* till the end = 384 sts. Used the colorwork pattern for the biggest size. 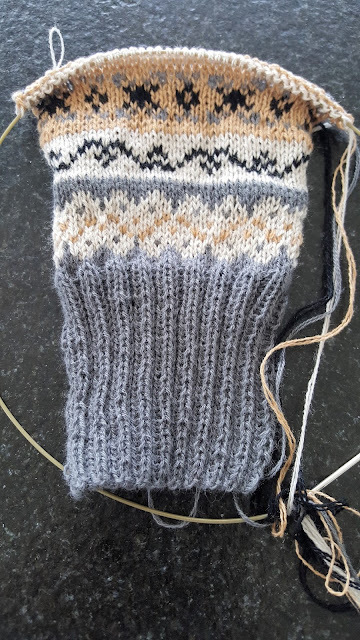 Started the colorwork pattern at the left side of the back (it was a vain precaution because there is almost no noticeable jog in this pattern). After dividing for body and sleeves I got 264 + 24 = 288 sts (added 6 sts on each side of underarms) for the body, 72 +8 = 80 sts for each sleeve. 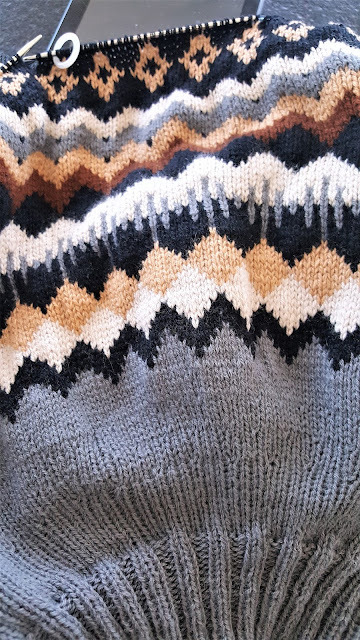 Finished the colorwork and knit for 30 more rows, shape lower back using Japanese short rows. 144 sts between side markers. Short row 1: Knit to 15 sts before the first side marker, turn. Short row 2: Purl to 15 sts before the second side marker, turn. Short row 3: Knit to 10 sts before the first side marker, turn. Short row 4: Purl to 10 sts before the second side marker, turn. Short row 5: Knit to 5 sts before the first side marker, turn. Short row 6: Purl to 5 sts before the second side marker, turn. Short row 7: Knit to the first side marker, turn. Short row 8: Purl to the second side marker, turn. Short row 9: Knit 5 sts after the first side marker, turn. Short tow 10: Purl 5 sts after the second side marker, turn. Finished with 20 rows of K2xP2 ribs and a regular BO (I tried the tubular BO as recommended in the pattern but didn't like how it looked). 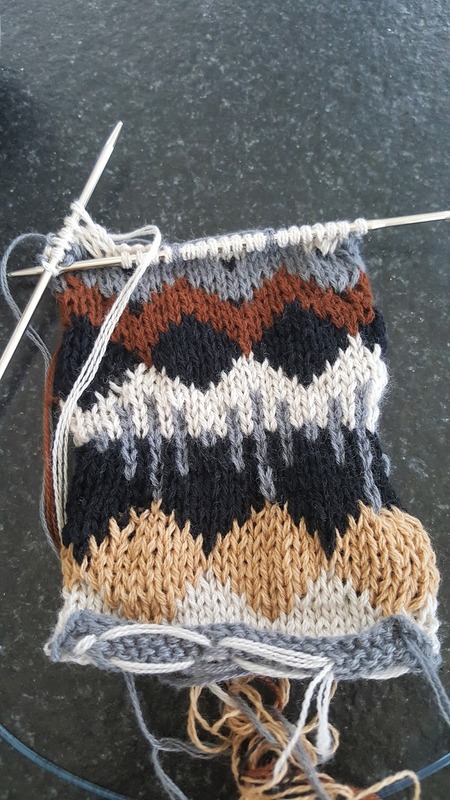 I had only 80 sts for each sleeve that turned out to be not too many so I didn't make the decreases, just kept knitting all 80 sts till the cuff (10 rows after the end of colorwork) and then *K2, K2tog* for one row to get 60 sts. 24 rows of K2xP2 ribs and a regular BO. I used 3 needles sizes - 2.00 mm for the ribbing, 3.00 mm for the colorwork, and 2.5 mm for the rest. The finished sweater is soft, drapy, and incredibly flattering. I know that I am going to wear it a lot. I already do, Floridian hot weather notwithstanding. My only regret - I should have divided for body and sleeves a bit earlier. With all the different yarns and a gazillion of sts it was hard to try it on often enough. But next time I'll know where to stop yoking. 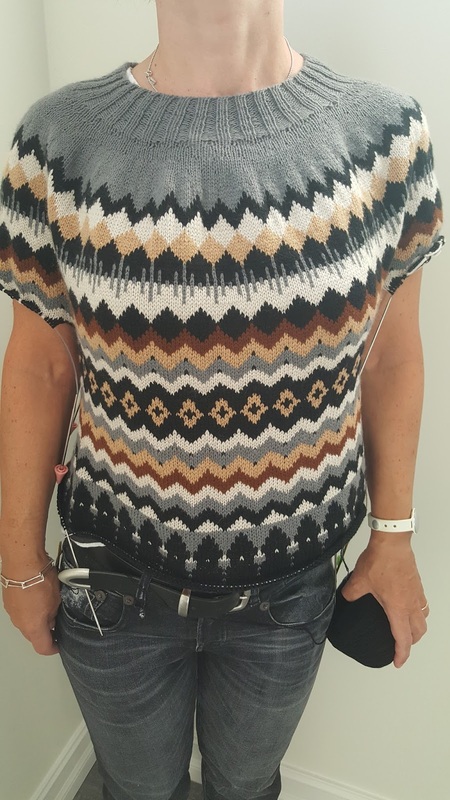 And this is the most important lesson of making the Elk Meadow pullover - now I know my numbers and can recreate this sweater with different patterns but the same yarn as many times as I want (and I have quite a lot of this yarn, remember?). I tried to be as thorough as possible detailing the entire process. As usual, all the specs and more pictures are on my Ravelry page. What do you think?